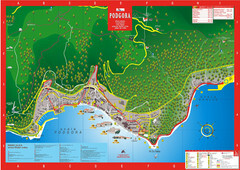 Panoramic tourist map of town of Korcula, Croatia and surroundings. From korculainfo.com: "Beside Old Town of Korcula and center of Korcula, in the upper left corner you can see group of tiny islands, locally called 'Skoji' as well as village of Lumbarda, a very popular day-trip destinations for locals and visitors alike. 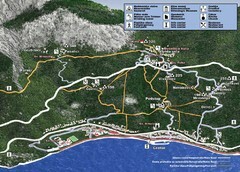 In the upper right corner there is village of Zrnovo and down on the right is bay of Zrnovska Banja."